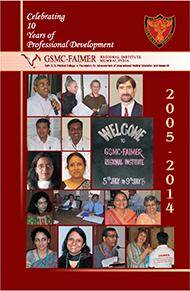 FAIMER is pleased to announce that GSMC-FAIMER Regional Institute Director Avinash Supe, M.B.B.S., M.S., recently received a Maharashtra Medical Council (MMC) Award in recognition of his work in Urban Health. The MMC Awards were instituted in 2015, and the inaugural award ceremony took place on April 17, 2016, in Nagpur, India. Thirteen awards were given to professionals in six different categories, for their creative and selfless ethical contributions to the medical community. Dr. Supe received an award of INR 100,000 from the MMC, and reports that he plans to use these funds to institute a research paper award for young surgeons. Dr. Supe currently serves as Director and Dean of King Edward Memorial (KEM) Hospital and also works as Professor of Surgical Gastroenterology at Seth G.S. Medical College and KEM Hospital in Mumbai, India. He is also a 2002 FAIMER Institute Fellow and a 2007 International Fellowship in Medical Education (IFME) Fellow. Detailed information on the MMC awards, as well as a collection of photos from the award ceremony, can be found on the MMC website.